There's a new team in town, and a new challenge blog soon to appear. The Morgan Fitzsimons Creative Team is being introduced this month. Today, I'm showing my first card for this new team. This is Flower 6, and will be available soon at Morgan Fitzsimons.com. If this image looks familiar to you, it was previously found at Fitztown. I colored the image with Copic markers. I cut the card out on my Cricut, using the Close To My Heart Artfully Sent cartridge. Card stock is also Close To My Heart. The crinkle ribbon is from 3 Girl JAM. Please join the Morgan's Art World Facebook group to learn more about this beautiful art, and for more great inspiration. Oh girlie this is lovely!! The pink/green combo is so lovely. I'm on vacation this weekend but wanted to stop by and say hello. Hope your weekend is beautiful. Great card. I like how you integrated images with Cricut cuts - very unique. Happy Mother's Day and thanks for joining us at BBTB2 this week. 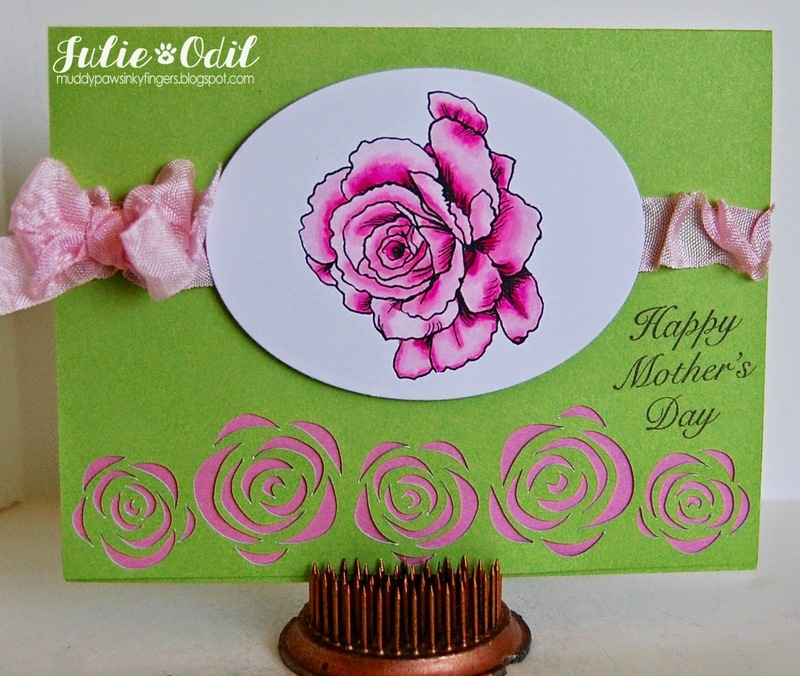 This card is so pretty with the rose border cut and the coloring on your rose image. The crinkle ribbon really tops it off. Beautiful Mother's Day card! Thanks for joining us at BBTB2.